Artwork by Sherry Karver showing at the Morris Graves Museum of Art. Did you ever get the feeling someone was watching you? These days, most likely someone is. What with security cameras, web cams, airport screening devices and the like, you are probably being watched more often than you realize. With privacy such a beloved right in this country, that's likely to get a few people hot under the collar, but the jury's out on whether it's a good thing or a bad thing. At least according to Bay Area artist Sherry Karver. "I see surveillance simply as a fact of our current times," she says in the statement for her current show at the Morris Graves Museum. Like any good artist, she's simply exploring what's going on around us, putting it in our faces and letting us decide what we think, and the results are fascinating. There are two kinds of work in her current show. For her paintings, Karver uses a technique she has developed over the years. Starting with photographs that she takes herself, she manipulates them in Photoshop, prints them out in large-scale black-and-white format and mounts them on wood panels. She then adds color by painting on many thin layers of transparent oil glaze, allowing the image to show through. The result is like nothing you've ever seen. The oil glazing is an old master technique that's been used for centuries. The color added over the black and white images gives them the feel of old-fashioned colorized photographs. But the glassy finish of the glazes looks thoroughly modern, and when you examine the work close up, you can see the characteristic pixels of a digital image. Not to mention the content, which is a very modern phenomenon - webcams! For the paintings in this show, instead of using her own photographs, Karver downloaded images from various webcams throughout the world and applied the same Photoshop and oil glazing technique. "In viewing these public webcams on the internet," Karver states, "I realized that surveillance cameras have taken on another unexpected purpose. They have become the historians of our contemporary era." I have to admit that I've never really checked out the world of webcams, but I got curious after seeing her work and reading her statement. 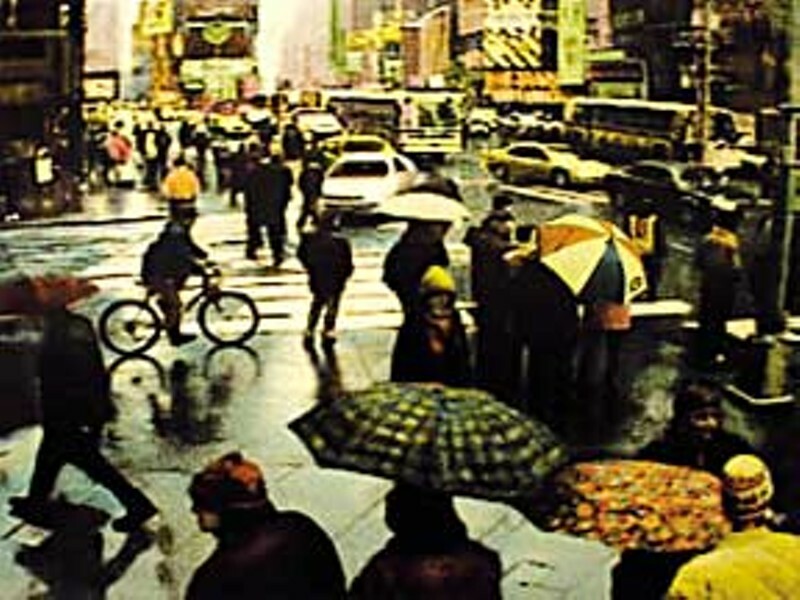 So, I went to the 48th Street and Broadway webcam that Karver used for her piece called "The Wave," and there was the same street corner that's in her painting - with different people of course. When I first looked it up, people were walking by, going about their lives, for the most part oblivious to the fact that I was watching them. One woman stayed in the same place though and looked directly at the camera every now and then. After a few minutes I figured out she was talking on a cell phone. She was probably talking to friends and telling them to go and find her on the webcam. Apparently, from looking at Karver's work, this is pretty common. That and people waving, holding up babies or signs "Hello Tout le Monde, I Heart New York," and "Happy Father's Day, Dad." The other set of work she has in the show is a little bit different but on the same theme. The images come from airport baggage screeners. You know when you go to the airport and you have to put your carry-on luggage through a screener while you walk through the metal detector, and the security guards and anybody standing in line with half an interest gets to peek inside your bag? Well, Karver had an interest and took photographs of the screeners as people's bags were being x-rayed. This was before 9/11 - I'm not sure she could get away with it now. But she said that at the time, nobody was upset about it or tried to stop her. She played with a collection of these photographs in Photoshop. Of course, all of them showed pretty benign images of shoes and hairdryers, so she added some elements to make them more interesting - a hand gun, a bomb, liquid-filled bottles and the like. "These items directly relate to our present day fears of what we imagine might be lurking in someone's bag," she states. Instead of printing the completed images in her usual way, she had them made into light boxes. But not just any old light box. 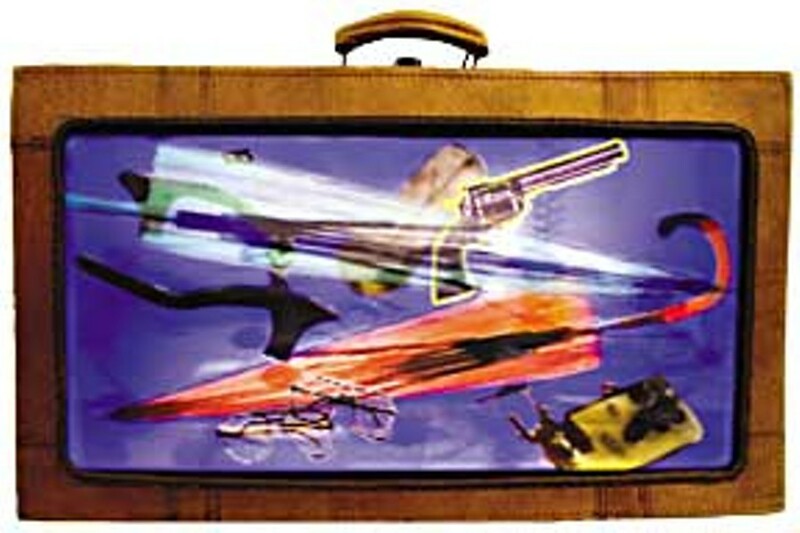 Karver poked around and found the coolest old suitcases, cut out one side of them, and put the images in them. This gives the illusion that we are looking into the contents of the suitcase. The result looks remarkably like what you see at the airport security checkpoints, only a bit more colorful. 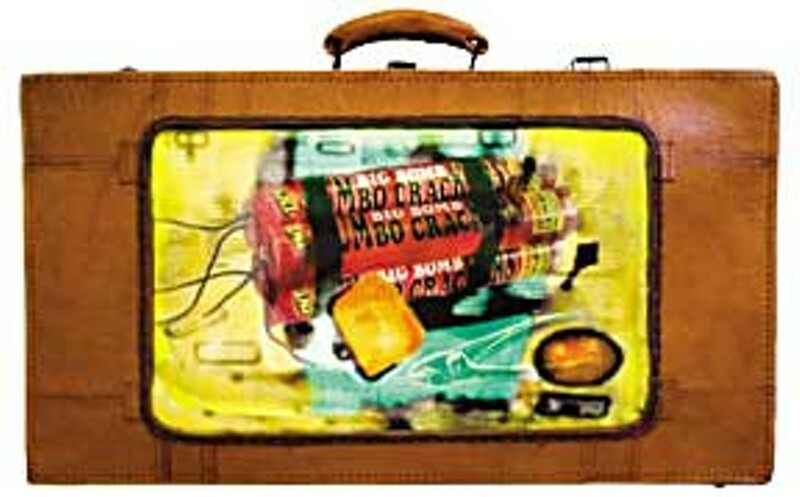 And I personally have never seen a bomb in anyone's carry-on - guess I've been lucky. In both bodies of work, Karver's art is an intricate blend of old techniques and modern technology. While webcams and airport X-ray machines are new, voyeurism and its implications are things we have always thought about. There's a tension between the desire to connect and the desire for privacy, wanting to peek and feeling ashamed of our curiosity. What more is the Internet, really, than a new way to do the same things we've always done - talk, show off, exchange information, express our love or anger? And airport security screeners are the modern equivalent to shaking hands (an ancient custom that proves to others you have no weapon in your hand). Karver's show will be up at the Morris Graves Museum of Art (636 F Street in Eureka) through March 25. Gallery hours are noon to 5 p.m., Wednesday through Sunday. While you're there, check out the other interesting shows they have, including Orr Marshall's retrospective, A Bridge to Japan, Amy Bouse's vivid abstracts and Frederick Hazard's found-object iron sculptures in the sculpture garden.